This edition is written as we prepare the launch of Illusions of Magic –the eBook—on Amazon.com. Please see “The Big Launch” below! Don’t be misled. You don’t have to have an e-reader (Kindle, Nook, etc.) to read this $2.99 eBook. There’s a FREE app on Amazon that allows you to read on many devices—an ipad, iphone, computer, etc. Novels labeled ‘historical’ try to translate into the present day the feel and meaning of being alive at a particular time in the past. They may succeed, or they may not. I wrote on this topic in the March 18 edition of The Washington Independent Review of Books. My essay suggests a useful distinction that would help readers select suitable books. Below, as usual, is “Wisdom with a Smile”, a couple of ideas to lighten your day. Later on I write about military veterans and Veteran’s day. In my wanderings on media, I ran across this: After almost fifty years, a deluxe novel on perhaps the most iconic Sci-Fi movie ever made has been published. And it’s illustrated! I hope you enjoy these musings. Please take time to comment, about the website, the blog, or any other topic. (Be sure to tell me who it’s from.) Simply send an email to: feedback@illusionsofmagic.com. Bashilov disagreed, saying military officers of the time should be depicted wearing powdered wigs. As Illusions of Magic opens, Nick and Connie have just returned from their matinee performance of live magic at the Minerva movie theater. The movie being shown is “Frankenstein,” starring Boris Karloff. The movie was the top movie at U.S. box offices following its release. It was named Frankenstein after the book by Mary Shelley. However, the creature’s appearance was solely the work of make-up artist Jack P. Pierce, who invented the flat head, electrodes in the neck and droopy eyelids. Applying the makeup to Karloff reportedly took four hours. So it is little wonder that audiences flocked to theaters to see this classic in the early 1930s. As some of you may know, I spend part of each year in Arizona, where I recently learned that a three-inch rain means three inches between drops. In my last blog, I quoted a couple of Groucho Marx’s hilarious quips. Upon reading Christopher Bray’s review of a recent biography of Groucho (http://www.spectator.co.uk/2016/02/when-groucho-marx-lectured-t-s-eliot/), I found out he didn’t really care for his showbiz persona. He thought he was better suited to a literary career. The Folio Society has just issued an illustrated edition of Arthur C. Clarke’s 2001: A Space Odyssey. This novel was written following the famous movie of the same name, starring Keir Dullea and Gary Lockwood, which captivated audiences world-wide. Although director Stanley Kubrick and Clarke collaborated on both the movie script and the book, Clarke was named the book’s official author, perhaps because of its basis in his short stories. In Illusions of Magic, fictional protagonist Nick Zetner describes his experience in the U.S. Army in France during World War I. That war ended Nov. 11, 1918, and celebrations of its anniversary were named “Armistice Day.” The name was later changed to “Veterans Day” to honor all who have served in America’s military. During Veterans Day 2015, I sat next to a fellow vet who had served as a swimmer in one of the U.S. Navy’s SAR units. This is the Search And Rescue service that aids people in life-and-death situations: a man overboard, a boat in distress, or a pilot in the water after losing his airplane at sea. These intrepid rescuers typically jump 10 to 15 feet into the water from a helicopter, and assist the victim into rigs that allow them to be hoisted from the water’s surface up to the hovering rescue helicopter. This vet told of an operation on the East Coast that placed him and a fellow swimmer in the Atlantic Ocean some miles from shore, where they were to be “rescued” by a SAR unit as a part of a practice exercise. He and I shared a laugh at the dark humor. The vet said that after some more minutes in that cold water, the SAR helicopter finally arrived and returned the two men to shore. This, the tale of a real, rather than a fictional, veteran. The eBook Illusions of Magic goes on sale on Amazon Kindle late in April. More than a decade ago I stumbled across Guiseppe Zangara’s botched attempt to kill President-elect Franklin D. Roosevelt in 1933. Chicago’s mayor, Anton Cermak, was among those shot, although he lived for nineteen more days. This uncertainty, plus the lack of legal means for replacing a deceased mayor, caused immense civic turmoil. I thought this true-life situation was an ideal backdrop for my story of love and intrigue in those days. A first draft was completed in 2007. Three more drafts were done, and publishers sought. Lacking success, I abandoned the book in 2010. Four years later I envisioned major changes that resulted in a complete rewrite. The rewrite was completed in 2015 and I began drawing illustrations. Other pre-publication tasks took the rest of the year. Publicity and promotion efforts are in progress, as well as the uploading of the book and other items to Amazon. If you’ve read some of Illusions of Magic on this site under the Preview button—or even if you haven’t—I think you’ll find the book exciting, informative, and entertaining. Please go to Amazon’s Kindle Store and buy the eBook—it’s only $2.99! 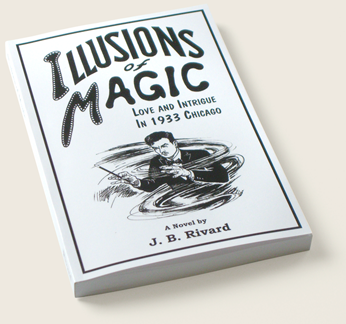 Tell interested friends to Google “illusions of magic illustrated novel”—it will take them right to this site.